A Foundation Earth Campaign to Inspire Earth Allegiance To Children & Schools is an educational outreach program with the central goal of promoting “earth consciousness” in the citizens of all nations. A critical aspect of this work is to instill in the minds of the young an identification with and desire to protect the planet. 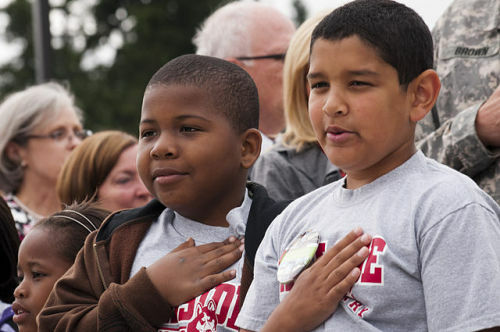 An effective and achievable tool to accomplish this a major campaign to have a “Pledge of Allegiance to the Earth” be adopted in tens of thousands of elementary schools, and recited daily by many millions of young students at the beginning of each school day. The campaign will originally be focused on the United States but eventually will also involve international outreach. As part of its educational outreach program Foundation Earth is initiating an unprecedented campaign to encourage the use of the Pledge of Allegiance of the Earth in elementary school class rooms around the nation as well as encouraging our international partners to do so. Of course schools can vary the language as long as it remains earth centered.